When Dino Smiley watched James Harden stun the Golden State Warriors on Thursday night, it brought back memories of South Central, Los Angeles, in the summertime. Smiley is the director of the Los Angeles-based Drew League, a famed basketball pro-am league that has been a summer hoops haven for NBA stars such as Kobe Bryant, LeBron James and Kevin Durant. Harden, an L.A. native, has been playing in the Drew League since age 16, and the up-tempo offense that Houston now uses with him at point guard is the same style that the Drew League has been accustomed to seeing him play for years. Harden has built a strong reputation in the NBA as one of the league’s top scorers by scoring 9,013 points since joining the Rockets during the 2012-13 season. As if Harden wasn’t already formidable enough offensively, last offseason the Rockets added an up-tempo offensive guru as their new head coach in Mike D’Antoni. With center Dwight Howard gone to Atlanta, the assumption was that an already Jordanesque scorer like Harden could average 40-plus per game under D’Antoni. But instead, Steve Nash’s old coach decided to make Harden a dual threat by making him the Rockets’ point guard, keeping the ball primarily in his hands rather than waiting for a pass from a lead guard. Harden averaged career highs of 29 points, 7.5 assists and 6.1 rebounds last season. Entering Thursday’s game against Golden State, he averaged 28.7 points, a league-leading 11.9 assists and 7.2 rebounds so far under D’Antoni. Harden had a well-rounded 29 points, 13 assists and 15 rebounds during a 132-127 double overtime victory that snapped the Warriors’ 12-game winning streak on Thursday. 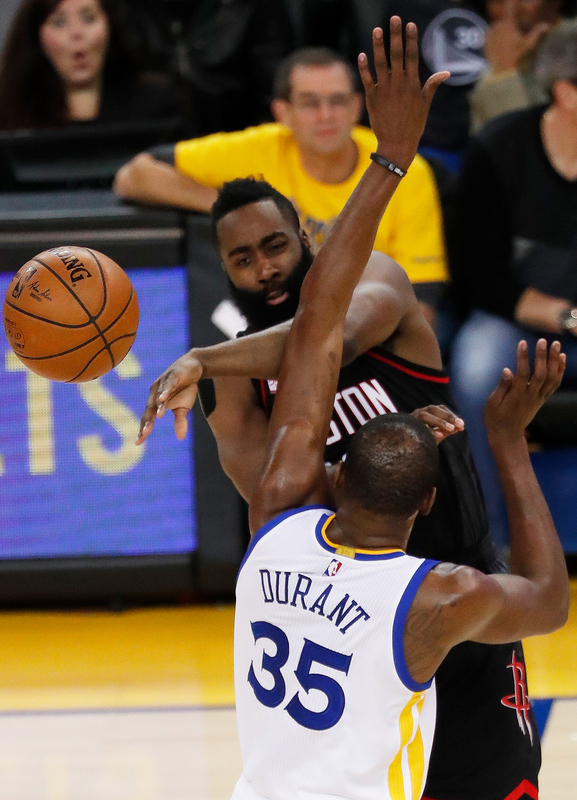 Houston Rockets guard James Harden (top) passes as Golden State Warriors forward Kevin Durant (bottom) defends during the first half of the NBA basketball game between the Houston Rockets and the Golden State Warriors at the Oracle Arena in Oakland, California, December 1, 2016. Harden said he’s not scared to freelance offensively or make mistakes since D’Antoni is already showing a lot of confidence in him. “I didn’t know what to expect,” Harden said about D’Antoni. “But now, it’s just free-flowing. He doesn’t try to control anything. If he has a play, he will throw it at me. But if I have something better, I’ll just tell him I got something better and he is just cool with it. That kind of relationship goes a long way. Rockets guard Bobby Brown also told teammate, and fellow L.A. native, Trevor Ariza that seeing Harden play in D’Antoni’s offensive system is very similar to what he sees with him in the Drew League. Brown is a point guard, but Harden primarily has control of the ball when they play together for LAUNFD in the Drew League. While the Rockets have the sharpshooter likes of Ariza, Corey Brewer and Ryan Anderson ready for passes, and big men Clint Capela and Nene ready for his alley-oop dimes, LAUNFD has athletes and talented shooters available for Harden to pass the ball to, as well. The Drew League became known worldwide when it developed into a hot bed for NBA superstars during the 2011 lockout, but Smiley has carried on the tradition since 1985. Former NBA players Byron Scott, John Williams and Lester Conner starred there in the 1980s. Los Angeles Clippers forward Paul Pierce and two-time former NBA All-Star Baron Davis starred in the league in the 1990s. The 2000s have belonged to such L.A.-area natives as Harden, Brown, Warriors guard Klay Thompson and center JaVale McGee, Toronto Raptors guard DeMar DeRozan, Los Angeles Lakers guard Nick Young, New York Knicks guard Brandon Jennings and former NBA guards Pooh Jeter and Casper Ware. Current Lakers Jordan Clarkson, Julius Randle and Metta World Peace played this past summer. Davis has even produced a documentary on the league. “It’s a lot of fun. It’s the best pro-am you can be in,” Thompson said. Smiley said Harden played four games for LAUNFD last season and has only missed playing in a Drew League season when suiting for USA Basketball during the 2012 London Olympics and the 2014 Spain World Cup. James Harden of the Drew League during rematch the game against the Goodman League at Cal State Long Beach on October 9, 2011 in Long Beach, California. James and Durant played in front of standing-room-only crowds at the Drew League during the 2011 NBA lockout. It was then held at the tiny and hot Colonel Leon H. Washington Park just north of Watts in one of the city’s toughest neighborhoods. It is now held in South Central, Los Angeles, at King Drew Magnet High School. But of all the games in Drew League history, Smiley said the most memorable was when Bryant played Harden in an exhibition showdown in 2011. Harden scored 44 points, but Bryant scored 45 points and nailed the game-winner. Highlights of the classic were posted on social media via cellular phone video as the crowd engulfed Bryant after his game-winner. The closest Harden came to an NBA title was losing in the 2012 NBA Finals while playing for the Oklahoma City Thunder. The four-time NBA All-Star, however, does have a championship in the Drew League, winning in 2015 with LAUNFD. While it wasn’t quite like holding the NBA’s Larry O’Brien Championship Trophy over his head, Smiley said Harden celebrated at half court with his teammates after winning the Drew League title in front of family, friends and locals. He hasn’t been shy about mentioning his Drew championship to the title-less fellow NBA All-Star DeRozan, either. Harden once played on a Drew League team run by the rapper The Game that struggled. After The Game’s team failed to make the playoffs, Smiley said Harden tried to switch to another team that was in the postseason. But even as big of an NBA star as Harden is, Smiley played by the rules and stopped the move. There is certainly a physical risk every time he plays in the NBA-sanctioned Drew League, but the 27-year-old said he has no worries. Harden said the Drew League “matured him as a basketball player,” he loves playing in it and his love for his young fans could keep him playing in it for many years to come. Dino Smiley speaks onstage at “The Drew” screening during the 2015 Los Angeles Film Festival at Regal Cinemas L.A. Live on June 13, 2015 in Los Angeles, California. The same toughness needed to survive in the neighborhood is displayed in the mentality on the court in the league. If you don’t play well at the Drew League, the crowd will let you know with jeers or boos regardless of your status. While it’s a pro-am league, the historical pride brings intensity to every game. In fact, one Drew League fan razed Harden about his defense last summer. “It’s a different environment,” said Harden, who played at Lakewood’s Artesia High School. “It’s the hood. Only the strong survive. You got to go up there and you have to have some game. You have to have some talent. You’re playing against grown men who are much more physical and stronger. For me, I was just out there trying to get buckets and get a name for myself. Smiley has allowed NBA players to come through a private entrance with valet parking to ensure their safety at the Drew League. Harden, however, has passed on the offer. He prefers to walk through the front door. Smiley expects the Drew League to vault to a higher level next summer as he’s heard rumors that Durant and Stephen Curry could join the Drew League team their Warriors teammate Thompson plays on. Brown said that LAUNFD will have Harden, Young and an NBA All-Star to be revealed later next season, too.